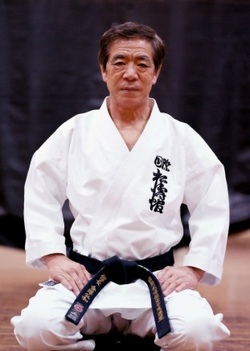 __Hirokazu Kanazawa (金澤 弘和, born 3 May 1931) is a world-renowned Japanese master of Shotokan karate. He is the Chief instructor and President of the Shotokan Karate-Do International Federation, an organisation he founded after he left the Japan Karate Association (JKA). Kanazawa is ranked 10th dan in karate. Kancho Kanazawa is the first karateka to have won the notorious All Japan karate Championship. In 1957 kumite champion, In 1958 kumite and kata champion, on one occasion winning the finals whilst nursing a broken wrist from an earlier event. Although trained in Judo in his early years, Kanazawa Kancho took up karate whilst at University under the then head of JKA shotokan, the late sensei Matsatoshi Nakayama. Kanazawa Kancho is also one of the few remaining karateka privileged to have studied under Master Gichin Funakoshi, the famous Okinawin school teacher who brought karate to mainland Japan from Okinawa and founded the Shotokan style. In 1978, Kanazawa Kancho created SKIF (Shotokan Karatedo International Federation). SKIF is now the world's largest Shotokan Karate Association under one chief instructor, having over 3.5 million members in over 107 countries.